It doesn’t matter how you camp – in an RV, a tent or a vacation rental. Those are just the places where you hang your hat and curl up for the night. Camping is an opportunity for serious fun and activities. Moreover, it’s an experience that you can customize for your family’s interests based on the season and where you’re going. You don’t have to pack everything in the world to stay entertained. In fact, there are plenty of simple activities for your next family vacation. To avoid brain storm sessions with your family, here’s our super Sun checklist of camping activities! There are tons of exciting things you can do in the water if your campsite is near a lake, river, pool, or other body of water. Some are very active; others are for lazy relaxing days. Slip on your bathing suit and have some fun in the water. Bring an inflatable wading pool and fill it with water. This is great if you head to a camping or RV resort with utility hook ups! Not all camping and RV resorts have a full list of amenities like Sun RV Resorts. If you’re rustic camping in the wild or you’re somewhere with limited amenities – or maybe just want some more variety – here are some great ideas to stay active with your family. Spelunking (caving) – Make sure you have an experienced guide with you. Part of the joy of camping is being closer to nature. Explore the great outdoors more with these activities. Be sure to respect the area where you are. Don’t disturb or damage the wildlife. Searching for wild berries, nuts, and other edible plants. Have a camping scavenger hunt. Staying active and enjoying the day is an important part of every camping trip. But you also have to embrace the down time and give your mind and body a nice break. 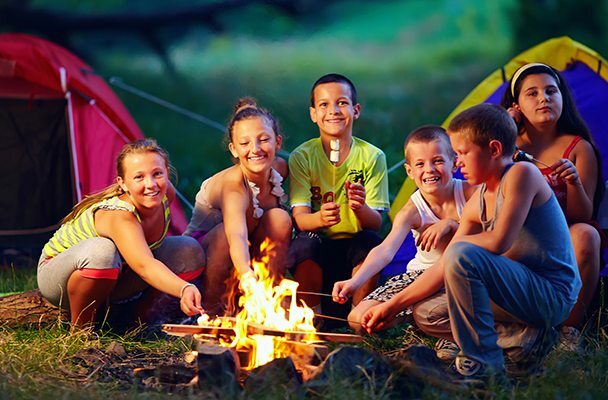 If you’re camping to get away from regular stress, then here are some great ways to relax and enjoy the family camping trip. Maybe the kids need some downtime in the tent. Or perhaps someone isn’t feeling well. There could even be some unexpected weather that is keeping you “indoors”. Of course, you could just be relaxing under the protection of your tent to escape the bugs. There are plenty of things you can do inside the tent, either alone or with friends and family. The camping trip doesn’t end when the sun sets. A whole slew of activities become available when night time comes and dark settles on the campground. The darkness is a thrilling time while family camping because you’re not dealing with the lights and commotion of the city. Check out these awesome nighttime activities. Make colored fire. Packages of colored fire crystals or pine cones are sold at most camping supply stores. Now that you have great ideas for things to do while camping, it’s time to get out there and try them! Be sure to share your adventures with Sun RV Resorts on Facebook, and if you liked this post, share it with your friends!